from all the beasts and bugs and birds? “You are Moooomm…you are myyyy moooommmm,” my eight-year-old daughter said slowly to me, articulating each syllable, one evening while I stood at the stove making dinner. “Um…OK, what are you doing?” I asked, puzzled. As a writer, I’ve always seen naming, giving words to things, thoughts, and experiences, as a crucial part of being human. As a person of faith, I’ve always thought of it as the very first job we were given in Genesis, whether you interpret it literally or figuratively: the job of naming things. Yet, the older I get and the more important words have become to me, the more hazy the line has become between the cause/effect relationship in linguistics. I usually subscribe to the philosophy that words have been chosen based on the object that they are naming, and therefore when you don’t know what a word means, you can often still guess if given multiple choice answers based on how the word sounds. Certain words sound angry, or lethargic, or joyful. But can the opposite also be true? Can things or people “become” based on their given name. The Sapir–Whorf hypothesis, a principle of linguistic relativity, suggests that yes, the structure of different languages and the words that they have, actually affect the reality that the speakers of that language experience. While there is some controversy over this theory, I believe there is some truth to it. I love, for example, reading compilations of words that have no translation in English, but exist in other languages. Is the reality in that culture different enough that they had to come up with a word for that feeling or sensation? Or has the introduction of that word changed their reality or the filter through which they see it? What about when you’re shopping: does the name of that lipstick influence your purchase? What about the name of that car, cup of coffee, or “skinny boyfriend jeans?” Undoubtedly, we are influenced consciously and unconsciously by names. Companies spend millions of dollars on marketing and advertising based on this truth. Or how about this? Have you ever met someone who didn’t “look like” their name? Sometimes Audrey and I imagine what other name each of us could look like. We give suggestions, to which the other often replies something like, “Oh no, you definitely don’t look like a Mary Ellen!” Well, a recent study by the APA suggests that there is some real truth to this. When they were given random names and faces of strangers, most people are able to match up the names with success greater than chance. The study suggests that people might alter there appearances subconsciously to match the cultural ideas about their name. The question that the article doesn’t address is why do people even imagine Bob having a rounder face in the first place? Is it the shape of the B’s and the roundness of the O? Or have there been a lot of round people named Bob? Which is it? Words have creative power, and that’s part of what makes them mysterious. I think maybe this is why people have superstitions tied around the spoken word, particularly with regards to the future. Some people knock on wood. A friend’s mother used to say “Bind that in Jesus’ name,” if someone said something negative about the future. While I don’t wish to enslave myself to a theory that says every word I speak leads me irrevocably in one direction or another, I do imagine that words have other dimensions to them that we don’t see, and are therefore powerful in ways that we’re not yet aware of. I’ll leave you with a final example that you can try applying in your life on a small scale. In the fall, I was listening to a free download of an audio book called “Get it Done: From Procrastination to Genius in 15 Minutes a Day” by an author named Sam Bennett. I admit, I was skeptical, but I listened to it now and then and tried out the exercises because I was feeling rather stuck. One of her ideas was to rename some of the larger projects on your to-do list to essentially make them more appealing. The idea is that it’s pretty draining to see something like, “Clean giant mess” on your to-do list, so what if you phrased it differently? I rewrote the names of the five larger projects on my to-do list, and I have felt a fairly large shift. Redoing my bedroom went from “Clean messy room” to “My soft sanctuary.” Eventually, I was able to let go of the pillows my husband had slept on and bought myself all new fluffy pillows, luxurious sheets, a soft linen duvet, and even a fake sheepskin rug to step on when I get out of bed. My room really did become my soft sanctuary. Writing a book became, “My beautiful baby.” Yes, it means the hard work of labor and the messiness of a birthing room, but thinking of writing as a process more like birthing has given me a sense of mothering and partnership rather than one of tugging or forcing. As part of the bedroom makeover, I had printed out a small sign from a children’s book that caught my eye with the word “Onward” and put it in my bathroom resting on the molding. 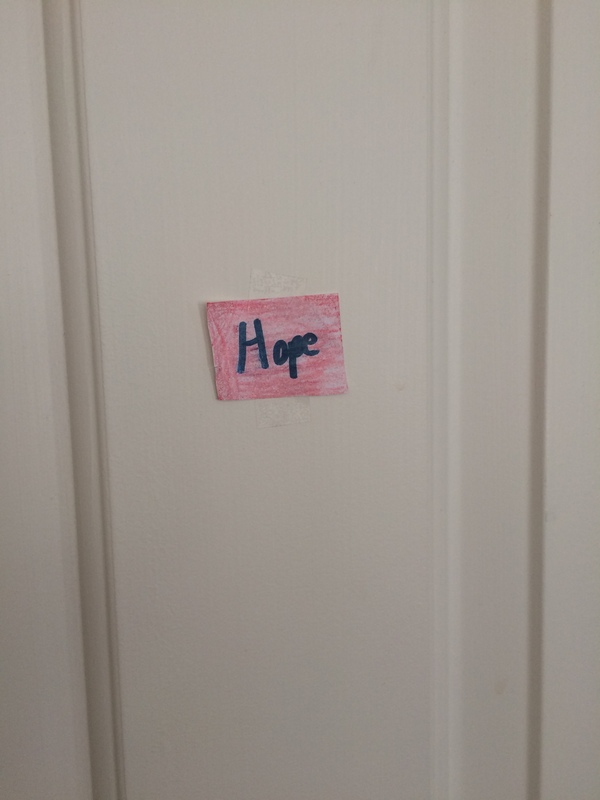 On my bedroom door, Audrey recently taped up a small sign that said “Hope” because one of the things she wanted to do for Lent rather than give something up (her original attempt to do this with candy failed after a day or so), was to do kind and uplifting things for people each day, and for her this often means leaving little notes around for me to find. Seeing each of these words in my personal space speaks life to me. In the Old Testament, in a chapter that became the foundation for the Jewish morning and evening prayer, Israel is commanded to write the words of God on their doorposts and gates of their house. I think a similar yearning for this kind of word power is happening today. Have you ever noticed how many words are on consumables in the last few years? Everywhere I go, I see catchy phrases on knick knacks, clothes, and art. For me, they’ve become overwhelming and commercial and often lose their meaning. But I think the abundance of this kind of decor points to the impact that just having a word displayed in or on your presence can have. In Romeo and Juliet, Shakespeare asked what was in a name. He suggested “that which we call a rose by any other name would smell as sweet.” (I remember this passage because I had to memorize the scene for my 8th grade English class. Hi, CJ! Yes, my English teacher has become a friend after all these years and reads this blog!) But I’m not sure that statement is true. Would a rose smell as sweet if it was called…a “pewdunkle?” I made that up- but really, would it? It turned out the names Capulet and Montague also meant enough to lead to the double suicide of its main characters. There is so much in a name. When you are feeling out of sorts, like I was a few weeks ago, speak the names outloud (when no one else is around preferably!) that let you “be more particularly the particular [person you’re] supposed to be.” Writer, daughter, mother, and my favorite after reading Henri Nowen’s beautiful book: Beloved. “I Name you Echthroi. I Name you Meg. I Name you Mr. Jenkins. I fill you with Naming. How funny… just finishing up M. L’engle’s book here. I feel the same way about Naming, that there is so much power in our words. When I used to be in the counseling field, I would hear of the impact(sadly often negative) words have made on people’a lives. It would weigh on them so much as if they were carrying an invisible heavy burden…until they are “Named” otherwise. I just love the way Audrey practices Lent by leaving these notes with uplifting words. What a difference our world would be if we would do that more! That is funny! We’re going back so we can read them together now. I hadn’t ever read them as a child, but have enjoyed L’engle’s nonfiction writing so much. Oh, as often happens, I needed this post. I’m feeling out of sorts, and in some ways, forgetting who I am, or rather, feeling like only certain aspects of myself – Grocery store shopper, meal maker, cleaner (on occasion), etc. Anyway, I recently reread A Wrinkle in Time, and I just restarted A Wind in the Door. I love those books, and so did my mother, which is perhaps why the connection is so fierce. I really like the idea of renaming my memoir, which feels unwieldy as of late, my beautiful baby. Thank you for this. There must be something in the air- so funny seems like a lot of people are reading or rereading that right now. She’s such a wonderful writer and her nonfiction writing on writing and faith has really spoken to me over the years (particularly her book on art- Walking on Water). Totally get what you’re saying about feeling like aspects of yourself. Yes- rename the memoir! I’m rooting for you! Totally doable. By the way, if you haven’t read Mary Karr’s book on memoir, I recommend that too. It’s helped me to read it alongside the writing/organizing. Julia, thank you for these words. I think names are so important! We really thought hard about the meanings in the names of our children. Anya Ruth- graceful and compassionate, Cleo Grace (short for Cleopatra)- the glory of her father and Matthew Ethan- gift from God and firm and strong. I often use words in my sketchbook and art work. I was going to post one here but not sure I can so will email it to you. Dear Dorcas, thank you for sharing! Yes- I can see the words in your paintings/sketches are very important. I love your work. I also think the names you chose for your children are so beautiful…sent you an email!